BPI Sports Nite Burn Review – Should you use it? When working with supplements, you’re bound to encounter weird, and cringe-worthy formulas, as well as splendid game-changers – and sometimes, there are supplements so unique that you’re not sure if it’s weird or fantastic. That’s just my dilemma with BPI Sports Nite Burn. With a formula mixed with ingredients that would help you sleep and burn fat at the same time, it’s like trying to figure out whether you should laugh or clap. BPI Sports is well known for designing their supplements to work in a stack. There’s no wonder why they created a non-stimulant formula that would help stim-heavy users to a good night’s sleep. BPI Sports Nite Burn claims that its formula would help you burn fat while sleeping, and also to recharge your body to prepare you for tomorrow’s workout. If this is indeed effective, it would be a fantastic product that everybody should try. Nite Burn’s main ingredient is Raspberry Ketone. Raspberry Ketone is an ingredient that is found in many fat burning supplements. It works by making it easier for your body to break down fat in cells in order to convert it into energy easier. By assisting in lipolysis, raspberry ketone effectively increases your body’s energy by burning fat deposits. Who uses BPI Sports Nite Burn? 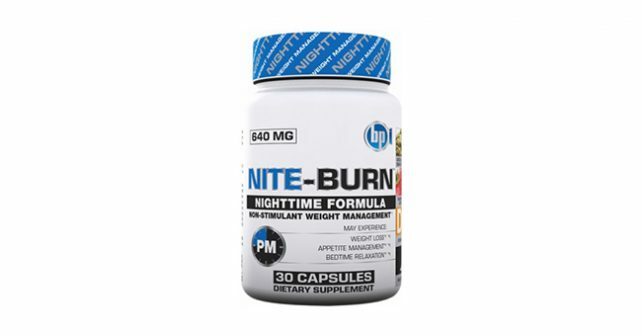 BPI Sports Nite Burn is a unique formula that can help users who are heavy stimulant users. Many fat burner products have stimulants like caffeine, ephedra, DMAA, and synephrine that would make it harder to lull yourself to sleep. BPI Nite Burn acts like a mild sleeping pill with fat burning qualities to help you sleep, while maximizing the fat burned by your body. We sent samples of BPI Sports Nite Burn to the lab for analysis. We found that it contains a small amount of Raspberry Ketone, combined with White Kidney Bean, and Green Coffee Bean Extract. This fat burning complex can be effective at the right dosage. However, the supplement profile tells us that this stack may not be enough to ensure fat loss. All these ingredients, and presumably a large portion is split between raspberry ketone and melatonin (as a sleep agent) makes us believe that fat burning benefits is at a minimum. The other ingredients in the mix work more as a sleep agent and relaxant rather than for fat burn. This makes it more apparent that the product might be masking as a sleep agent rather than a fat burner which it claims. The mix also contains a hefty 1200IU of Vitamin D3. Vitamin D3 is known to help maintain a healthy body, especially in maintaining a healthy cardiovascular and nervous system. However, there’s no evidence that points to vitamin D assisting in lipolysis or any bodily function related to reducing fat deposits. Nite Burn is available for $23.19 per 30-capsule bottles. The ideal intake is one capsule before bedtime, which puts it just south of a dollar per day. User reviews about Nite Burn is split between their experiences about Nite Burn’s sleep agent. Some slept well, while most had trouble getting up in the morning because they felt groggy. Can you really burn fat while you’re sleeping? Yes. Your body burns through the calories that you eat every day to fuel the energy needs of your body even when you’re sleeping. However, a low dose of Raspberry Ketone would only slightly elevate your metabolism when you sleep. I can’t say for certain if this would work better with a stack, but I really see no point in taking a fat burner to sleep. If you can’t sleep because of the stims, just take a sleep aid. It works better. If you’re looking to lay off the stims, check out the best supplement for weight loss, Garcinia X. Garcinia X contains high levels of Garcinia Cambogia with 60% HCA. Check it out!